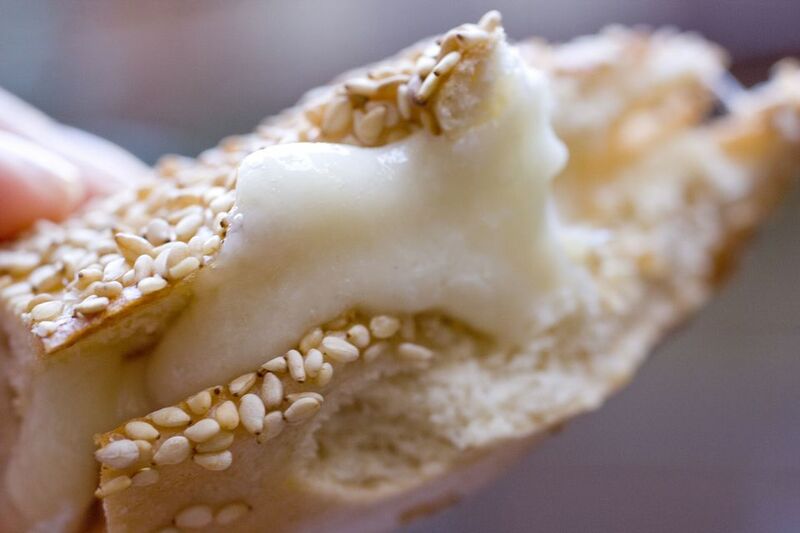 Kefalograviera is one of the newer Greek cheeses but has become one of the most important cheeses commercially. Production was started in the 1960s and it has quickly become a favorite table cheese. It is produced in the rugged mountains of Epirus and Macedonia and is made from 100 percent sheep's milk or a mixture of sheep and goat milk. It is aged for three months or longer before it is available for sale. The taste of this hard yellow cheese is salty; it has a rich aroma, nutty flavor, and smooth mouthfeel. Kefalograviera falls somewhere between kefalotyri and graviera, hence the name, having a similar intensity to kefalotyri with the mellowness of graviera. Kefalograviera is sold in wheels or wedges. It has a yellow to dark brown rind and is dotted with little air holes. It should be firm but smooth to the touch. It can be found at Greek or Mediterranean markets, and a low-fat variety has recently appeared on the store shelves. You may find the name spelled kefalograviera, and although kefalotyri is its own variety, sometimes this cheese is labeled as such. Kefalograviera is prized as a table cheese as part of an appetizer, or meze, platter, and is ideal paired with Greek spirits such as ouzo as well as white wine. Kefalograviera is the cheese commonly used in saganaki, any dish prepared in a small frying pan with the same name, where the cheese is cut into triangles, coated with seasoned flour and lightly fried. Kefalograviera is also grated and sprinkled atop pasta, and as part of baked dishes and gratins. It is also delicious with lamb. The rind can be left on the cheese whether slicing and serving or frying. Kefalograviera should be stored in the refrigerator. Remove about one hour before using so it can come to room temperature. If you cannot find kefalograviera, you can substitute other cheeses but keep in mind the resulting taste will not be exactly the same. You can try pecorino Toscano, pecorino romano, Parmesan, Regato, kefalotyri, aged myzithra, and aged Gruyere.